Nast childhood home: Bottom center left, I have highlighted in green, Nast’s childhood home. The family originally resided on the lower west side on Greenwich Street, but soon moved to William Street near Frankfort Street, in the Fourth Ward of Manhattan. Five Points, in the Sixth Ward, is located just north and slightly east. Five Points is highlighted by an orange triangle, located in the Sixth Ward of Manhattan. Five Points contained the largest concentration of Irish immigrants, as well as other immigrant groups. Chinese on Mott Street: According to Tyler Anbinder, Chinese Americans began arriving in greater numbers in the late 1870s from the West Coast, in response to anti-Chinese sentiment, fueled by such actors as Denis Kearney and his cry of “the Chinese Must Go.” Landlords began leasing residences to the few Chinese who came in the lower Mott Street near Pell Street area. Though their arrivals were small in number, compared to other immigrants, the Chinese concentration around Mott Street was perceived as an invasion (398-399). Nast had long since left the neighborhood when the Chinese started to arrive. As a young married man, Nast lived in Harlem, near Mount Morris Park, and during the later part of the Tweed years, moved his family to Morristown, New Jersey. 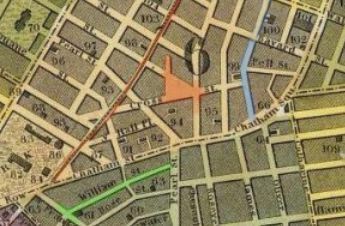 It is not known if Nast’s parents or sister continued to live on William Street, or how often Nast would visit this area in the 1860s or 1870s. It is not unreasonable to assume he kept in contact and knew about the comings and goings of this neighborhood, as this was Tweed’s stomping grounds. Maps courtesy of David Rumsey Historical Maps – reprinted under the Creative Commons licensing. (highlights shown are overlays to the original map – created by M. Walfred). 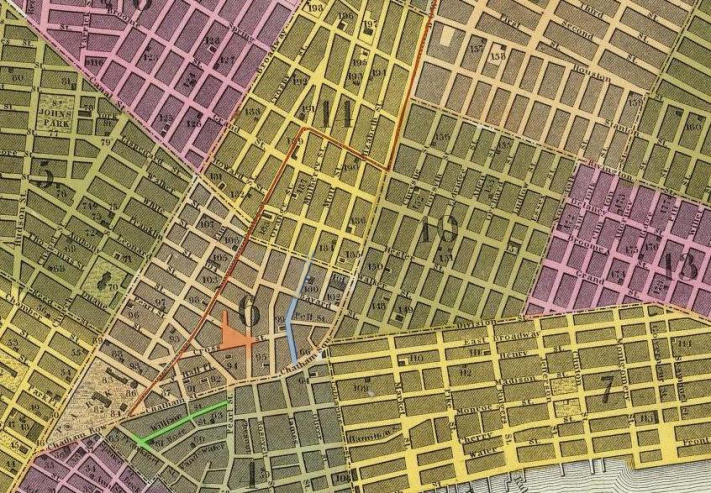 The link at the top of this page will connect viewer to an interactive map that can be enlarged at higher resolutions and viewers can pan across the City of New York, as it was mapped in 1846, the year the Nast family arrived in New York. A comprehensive look of New York City neighborhoods can be found with this graphic.